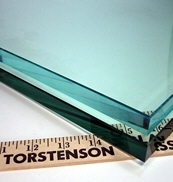 Torstenson Glass Company offers a large array of glass processing services. From picture framing glass to glass for lighting fixtures.We stock heat resistant glass and Technical Glass Products. We also offer glass for use in store fixtures and for use as table tops and can help you with creative solutions for your design project. TGC offers a full line of products that are of interest to picture framers. Listed below are just a few of the items we stock. Please contact us if you have further requirements. Clear Glass: Available in Boxes (50 sq. ft. per box) or 2,000 and 4,000 lb. pallets. Reflection Control®, “non glare” glass, single side etched for clarity. Conservation Clear® with UV filters to block some harmful light rays. Conservation Reflection Control®, also “non glare” with UV filters to block some harmful light rays. AR Reflection Free, anti-reflective glass, coated edge to edge. Museum Glass®, anti reflective, high performance glass with UV reduction. All of our framing glass can be cut with conventional methods. They require no special handling or cleaning and are usable edge to edge. 1. Lighting Glass Panels are energy efficient. 2. Glass is reliable and long lasting. 3. It’s static free and scratch resistant. 5. Lighting Glass Panels can be tempered for added strength. 6. Glass is unmatched in economy. This page only illustrates some of the uses for Flat Glass Lighting Panels. Think of all the other opportunities our products have to offer. Visit a link below to check out all our in stock options. Contact us for additional info. TGC carries in stock the following table tops. If your size is not shown, please contact us. Special orders are always welcome.